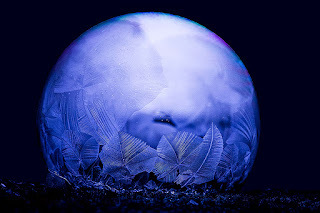 Here is another frozen bubble that I had fun trying to do this winter. For this one I used a technique suggested by a photographer on G+ who does some really beautiful ones along with his magnificent macro snowflakes. Anyway, I shot this at night using a bright flashlight behind and a special lens to diffuse that light. I think it gave the bubble a glow like effect. I just love the patterns that are created by the bubble freezing.